Escape to paradise. Enjoy beautiful sunrises & sunsets, near by shopping, restaurants, local watering holes, beautiful historic districts, as well as fishing, kayaking and boating from private dock just steps from your back door. We are located in the nicest, most unique neighborhood in Port Charlotte. 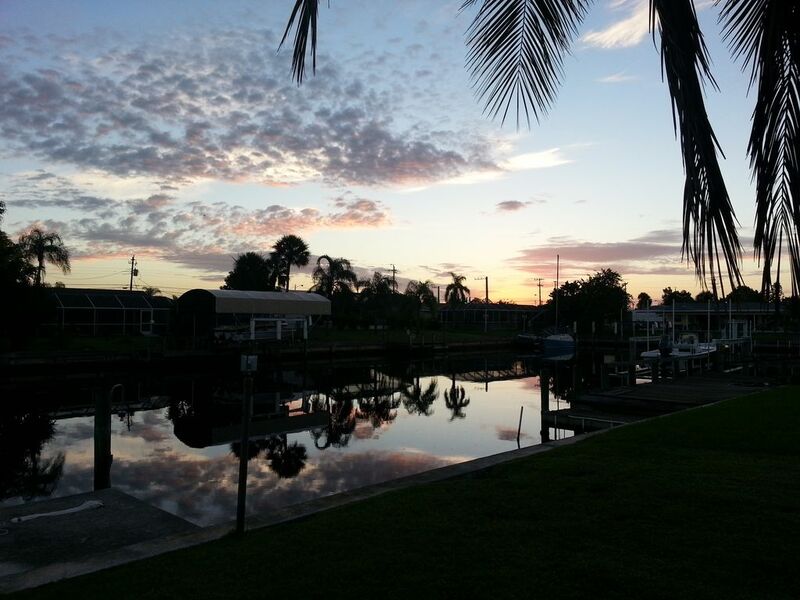 The house is located on a beautiful wide canal with open water to Charlotte Harbor and The Gulf.of Mexico You can take a short walk, ride on any of our bicycles, or paddle, on one of our kayaks, to the beautiful, quiet Port Charlotte Beach Complex. The park boasts a heated pool along with a playground, tennis, basketball, volleyball & bocce courts as well as horse shoes, picnic pavilions and boat ramps all in this beautiful, quiet, cul-de-sac community. Please contact me with any questions or special requests. I will always do my best to help make your vacation a great one! This home has been newly renovated with an amazing kitchen. This is not a bare bones rental kitchen. It has LED lighting, all new appliances and is equipped for everything from Belgian waffles & Espresso, to Sushi & Fondue. We even have a large crock pot so dinner can be waiting for you when you get home, or fire up the Weber grill and enjoy your favorite meat and veggies or your catch of the day. The all clad stainless cookware and fondue set makes for a great place to prepare any meal. What ever your preference, this kitchen should meet most of your culinary needs. There is a 55" flat screen UHD TV with DVD & Internet cable in the main living area to watch your favorite movies, shows or sporting events. High speed wireless internet as well as a wireless printer is also available. 32" flat screen televisions with DVD players are in every bedroom. The bedrooms have comfortable mattresses with quality Egyptian cotton linens and plenty of pillows. Plenty of thick, soft bath towels and additional beach towels are provided. Enjoy your morning coffee or espresso, from the automatic espresso & coffee machine along with a batch of my own fresh, custom roasted coffee beans. Sitting on the lanai enjoying a beautiful sunrise is a great way to start the day. The private hot tub and tiki bar area will be a favorite area for entertaining and relaxing. The house is completely renovated with a great kitchen, everything for entertainment as well as a relaxing and romantic outdoor adult area which includes a private hot tub and tiki bar. This neighborhood is very unique. It is quiet and friendly and it surrounds the Port Charlotte Beach and Pool Park. There is no through traffic in this neighborhood as every street is a quiet cul-de-sac, so walking and biking is a peaceful experience. As quiet as this neighborhood is, it is only 1 mile from the business district of Port Charlotte. The hospital, shopping mall, dozens of unique shops, restaurants & bars, mini & regular golf as well as Historic Punta Gorda and Fisherman's Village are all just a few miles away. With six bikes available there is a lot to explore. Whether you bring your own boat or you use our kayaks, access to the 200+ miles of Charlotte shoreline from your own private dock. Being in the middle of Florida's Suncoast means that you are an hour or less from dozens of amazing beaches. From the nations #1 rated beach, Siesta Key, and it's quartz crystal white sands in Sarasota to Beautiful Boca Grande on Gaspirilla Island at the mouth of Charlotte Harbor, down to Sanibel and Captiva Islands in Ft Meyers, you have many choices. We are also only 2 1/2 hours from the Disney World Complex, Universal Studios and Islands of Adventure, Lego Land as well as the rest of Orlando's attractions. What ever your reason for your tropical getaway, we are sure that you will find something to satisfy your needs. Direct access to Charlotte Harbor/Gulf of Mexico. No Bridges to open water. Beautiful quiet saltwater canal. Kayak, boat & fish from back yard. Stainless with water & ice. Fully automatic espresso/coffee machine to make fast and easy espressos, cappuccinos and coffee. Standard coffee maker and a Cold Brew Carafe. Fully stocked with plates, dishes, glasses, stemware & utensils. Fully stocked kitchen. All Clad cookware & fondue pot, Slow cooker, Rice Cooker, Pyrex bakeware & bowls, Baking sheets & Pizza sheet. Bicycles, Kayaks, Tennis equipment, Basketball, Volleyball, Bocce ball set, Horseshoe set, Fishing rods & some tackle. Two tandem and two single kayak available with life jackets. 4 Adult beach cruisers & 2 child bikes. Nice tow behind child carrier that attaches to bikes are available. Plenty of room to keep your boat and easy launch at community boat ramp. Or use any of our provided kayaks. Tennis, basketball & volleyball courts located at the beach complex. Dozens of nearby public and private golf courses. Wide doors in to house & master bedroom area. We have had wheel chair guests, but house it not totally wheel chair accessible. Heated community pool located at the Port Charlotte Beach park, walking distance. 6 person hot tub with privacy fence. Property is well maintained, in a nice neighborhood. Home has everything you could want. Has an upscale feel. Had a couple of questions about things to do in the area, and Dwight was available by phone, and even checked with some of his friends to offer suggestions. Supplies for your use, such as beach chairs,bicycles, etc., are all like new, with all the proper equipment such as helmets, paddles, safety vests. Washer and dryer are also new looking. Not furnished with left overs, but like what you would choose for your own home. Same goes for the kitchen - nice design, well equipped. Screened porch is larger and nicer than the pictures show. Owner lives not far away, and personally maintains the property. Thank you for nice review. It was great meeting you and your wife. We have always attempted to keep our home updated. We choose to repair or replace before it looks "worn out" and we appreciate when our guests notice and appreciate this effort. We always look forward to hearing our guests impressions and take any suggestions very seriously. This is what helps us keep our home "5 Stars!" Great house! We enjoys the super comfy beds; we cooked in the thoughtfully laid out kitchen, rode the bikes, and ate our breakfast looking out at the canal from our screened in back porch. The nearby park on the Peace River was lovely. Loved our stay. Location was perfect for us. It was a pleasure meeting you both and having you stay as our guests. We always enjoy having great guests like you. I hope you had a safe trip home and we look forward to seeing you again next year! The house was great, the hot tub was one of the best parts... Sadly red tide ruined any chance of enjoying the beach and the pool was closed for maintenance the entire week. The house was fully furnished with everything you could need from towels to a rice cooker, the beds were comfortable and the neighborhood was very quiet. The host was very open to answering any questions we had and provide us with Home roasted coffee. I would definitely stay here again and recommend it to friends and family. I am sorry we only earned 4 stars. Unfortunately, I have no control over the red tide and the county park schedules. There was no red tide in the water around our house or at our local beach though. The red tide stayed about 15-20 miles away on the Gulf beaches, thankfully! I am happy that our home and the items I can control were to your satisfaction. Thank you for staying with us on your vacation! James responded to my email stating that we were sorry we did not earn a 5 star review from him. "Your hospitality and the house were a 5 star, maybe we recieved bad info,(about where the Red Tide was) we drove over to manasota key and there were alot of dead sea creatures over there with the red tide warnings too." Manasota Key is 25 miles from our home and understandably when families come down to Florida on vacation and there are dead fish on the Gulf Beaches, it makes for a "not so nice visit". Our local Charlotte Harbor beach has remained clean during this Red Tide outbreak. The house has everything. It's clean and tidy. Best place to vacation ever. It was our pleasure having you and thank you for leaving our home in such perfect condition! It was very nice meeting you both. Please contact me if you ever want to visit SW Florida again. Thank you for a wonderful getaway!! We had a wonderful time on our vacation. The house was very nice. It was in a quiet neighborhood. It has everything you would think you might need for your stay. It was close to Punta Gorda and the Fisherman's Village which has good restaurants and shopping. There were a couple things we had trouble navigating which was the TV Service-Sling TV. We like to watch local news whether we are home or on the road. We could not find any local stations. The Master Bedroom alarm clock kept going off at around 6 O'clock every morning and couldn't get it to stop so we were up early each morning. We are in our upper 70's and not gadget people. Overall it was a very nice stay. The owner checked in with us during our stay to make sure we had everything we needed. El Sol Naciente, The Rising Sun. Most who visit the West Coast of Florida know about and look forward to the gulf sunsets. But after buying this house the one thing we noticed morning after morning was the watching the beautiful sunrises from the master bedroom or the private hot tub or the lanai. We are situated on a canal off of Alligator Bay between the Myakka & Peace Rivers at the north east end of Charlotte Harbor. This is a beautiful tropical area known for it's fishing & boating. Our house is located about 1/2 mile from the Port Charlotte Beach Park. Just a short walk or kayak trip from the house. The park has a small (usually uncrowded) beach, a public pool, Basketball, Tennis, Volleyball & Bocce courts, horse shoe pits and a playground for the kids. We are on a quiet cul de sac neighborhood only 1 mile from Rt 41 and all the restaurants, shopping and conveniences of being close to town. There is a nice miniature golf course just down the road and Punta Gorda and its beautiful downtown and Fisherman's Village are just minutes away. The beautiful Gulf Beaches are about 20 miles away and Siesta Key and Sanibel Island are about an hour away. For the young at heart, we are under 2 hours from Busch Gardens & Lego Land and a little over 2 Hours from Walt Disney World. Maximum occupancy 8 people, exceptions made for large families. Pets must be pre-approved and fee is per pet. Special events and Holiday rates may be higher.